Cardinal Thomas Wolsey was the son of a butcher and cattle dealer. (Wolsey himself spelt the surname Wulcy). Magdalen College, Oxford. (Graduated at 15). 1497: Elected a Fellow of Magdalen College, Oxford. 1498: Wolsey was ordained as a priest at Marlborough by the Bishop of Salisbury. He became one of the domestic Chaplains to the Archbishop of Canterbury were his administrative skills were soon noticed. On the Archbishop’s death he served Sir Richard Nanfan who introduced him to King Henry the Seventh. 1507: He becomes Chaplain to King Henry the Seventh and was favoured by Bishop Fox the Lord Privy Seal. 1508: Goes on a diplomatic mission to Scotland. 1509: He is created Almoner to the new King Henry the Eighth in November. 1511: Wolsey signs documents under the seal of a Royal Councillor. 1513: He crosses to Calais on 30th June with the King and returns to England in October. 1514: Wolsey is created Bishop of Lincoln by a Papal Bull in February. Created Archbishop of York in September. He started the building of Hampton Court Palace during December. 1515: Created Archbishop of York. On 15th November he is made a Cardinal and the ceremony in Westminster Abbey is held on the 18th November. Created Lord Chancellor. By now he is almost single handedly in control of English foreign policy. 1518: Became Papal Legate in May. 1521: Wolsey presides over the burning of Lutheran books in the courtyard of St. Paul’s Cathedral. (August) He attends the Calais Conference in August and then the Bruges Conference. Created Abbott of St. Albans on 17th December. 1523: He goes to Parliament to ask for £800,000 on 29th April. Given the Bishopric of Durham on 30th April. 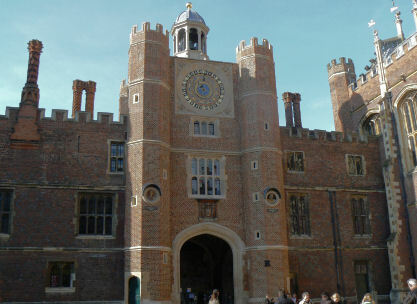 1525: Gives the King permanent accommodation at Hampton Court Palace. 1526: Presides over the burning of Lutheran books at St Paul’s Cathedral and protests against the Lutheran doctrines of Robert Barnes and some of the Hanseatic merchants. 1527: King begins talk of a divorce from his Queen Catherine of Aragon during April. The first legatine trial about Henry’s marital status is held in May. King Henry is informally separated from Catherine on 22nd June. Went on a diplomatic mission to Amiens in France during July. 1528: Divorce tried in England on 13th April. The Pope promises not to interfere during July. 1529: Anne Boleyn turns against Cardinal Wolsey. In June Cardinal Campeggio stalls the trial on the divorce until October. Wolsey is indicted for Praemunire offences. On 17th October he is forced to surrender the Great Seal of Office and on 19th October his fall is announced in the Star Chamber. His presidency of that body moves jointly to the Dukes of Norfolk and Suffolk. 1530: Wolsey is sent North as punishment.He is arrested at Cawood near York on 4th November. He moves on to Leicester Abbey. 29th November 1530, Leicester, Leicestershire, England. The Lady Chapel, Leicester Abbey, Leicester. Christchurch College, Oxford founded by Wolsey. Hampton Court Palace, East Molesey.